What Are the Uses & Benefits of Horse Chestnut? How Do I Take Horse Chestnut? Are There Any Side Effects of Horse Chestnut? How Do I Pick a Good Horse Chestnut Product? In order to help you find a good product we’ve researched & narrowed down the best horse chestnut supplements on the market right now. 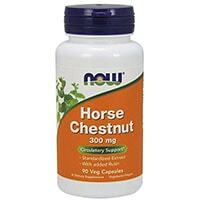 This is a powerful horse chestnut supplement with 400mg in each capsule. It’s a bit less concentrated at 18% aescin, but the increased dosage size more than makes up for the lower concentration. It also contains Butcher’s Broom, a herb that is sometimes used for circulation problems. Solaray is a health brand and a division of Nutraceutical, one of the largest health product companies in t the US. They produce more than 1,000 products and are committed to quality and consistency across all their product offerings. This is a great product at a good price. The added Butcher’s Broom is unique. This herb may have some circulatory benefits, but it hasn’t been sufficiently studied. 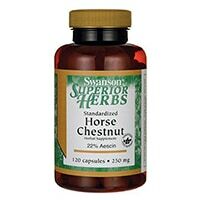 This is a simple and effective horse chestnut supplement with 300mg per serving. It contains added rutin, a free radical scavenger thought to potentially boost the antioxidant activity of horse chestnut. NOW Foods is a massive company specializing in the manufacture of health foods and supplement products. They have over 1,400 unique products and are well known for their quality and consistency. This is an effective product from one of the most trusted names in the business. The addition of rutin is unique, although it’s unclear if rutin will actually increase the potential benefits of horse chestnut. This is a highly rated horse chestnut supplement with 250mg per serving, and a 20% aescin concentration, it’s a powerful and effective option. Beyond that, it’s Tru-ID Certified, Non-GMO Project Verified, and vegetarian. Nature’s Way is a hugely popular manufacturer and distributor of a wide range of health products. They are the first major health brand to become TRU-ID Certified, which means all their ingredients are DNA-tested using cutting-edge biotechnology. This ensures an exact match between label listings and actual ingredients included. Nature’s Way Horse Chestnut contains an ideal dose, is made by a trustworthy company, and is independently certified and verified by several third parties. This is a solid choice to try out. 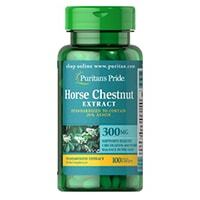 This is an affordable horse chestnut supplement that comes in no-frills bulk packaging. 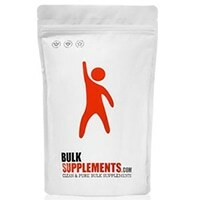 Instead of offering premade capsules, BulkSupplements simply offers a bag filled with pure horse chestnut extract powder. This makes it more affordable, albeit a bit less convenient. BulkSupplements is a manufacturer and wholesaler of supplements and pure ingredients. They keep quality high and prices low by selling in bulk. This is a great product for those looking to save some money. It’s a bit less convenient than traditional pills, though. This is a simple, straightforward product offering 300mg per serving. It’s made by a reputable company, but it’s a bit expensive. Puritan’s Pride is a large-scale supplement manufacturer with more than 40 years in the health industry. They back all their products with a money-back guarantee. This is a simple and good product, but there are cheaper options that offer the same thing. This is a good horse chestnut product with 400mg per serving. Thompson is a manufacturer and distributor of health products that’s been in business since 1932. This is a good product, but it’s on the expensive side and the concentration of aescin is lower than average. 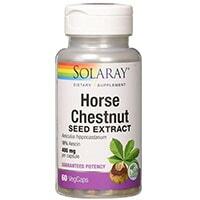 This is a strong horse chestnut supplement standardized to 22% aescin. Swanson is a large-scale health product company headquartered in Fargo, North Dakota. This supplement offers the highest concentration of aescin, but the dosage size is lower, so it evens out to an average potency. 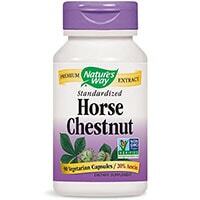 This is a standard horse chestnut product with 300mg per serving. GNC is a retailer of health products and supplements. You can find their stores in shopping centers and malls across the country. This is a standard product, but it’s more expensive than average. This is a simple product with a relatively weak concentration of aescin, the active ingredient in horse chestnut. Nature’s Life is a health and wellness company with over 40 years in the industry. They currently offer more than 400 products. This is an okay product, but the low potency is a notable downside. This is a good horse chestnut product that is sold in a 2-pack. It offers 300mg per capsule. Planetary Herbals is a supplement manufacturer based in California, that focuses on using natural herbs to craft helpful dietary supplements. This is a good product, and the per-serving price represents good value. However, since it’s sold in a two pack of large bottles, it’s best for folks who want to stock up. Horse chestnut, known formally by its scientific name aesculus hippocastanum is a large flowering plant. It’s leaves, bark, flower and seeds are used to make medicines and supplements. The seeds and leaves are the most popular components for use in modern supplements, but the entire plant has been used in various traditional medicines. Horse chestnut contains a group of molecules known as aescins, which are thought to be beneficial for circulatory health. Horse chestnut has some proven benefits, and many claimed benefits that have yet to be verified by clinical science. Varicose Veins: Several studies have shown that horse chestnut can help symptoms of chronic venous insufficiency, a condition caused by varicose veins. This effect is attributed to the concentration of aescins found in horse chestnut supplements. Circulation: The aescins found in horse chestnut can potentially help to improve circulation. Some symptoms caused by poor circulation, including pain, tiredness, itching, swelling in the legs, and water retention can be addressed via the use of good horse chestnut supplements. Antioxidant: Horse chestnuts are rich in antioxidants including flavonoids. Antioxidants can help keep you healthy by fighting damage caused by free radicals. Fertility: There is evidence to suggest that horse chestnut extract may improve sperm quality in men with varicocele-associated infertility. Further studies are needed to confirm these findings. Other Uses: Horse chestnut is often used for hemorrhoids, diarrhea, cough, fever, menstrual pain, and more. However, these uses have not been adequately studied in clinical science. Overall, horse chestnut shows promise in several areas, primarily in its use in circulatory health. Beyond that, the supplement requires much more research, as many of the potential uses have not been examined by reputable medical trials. 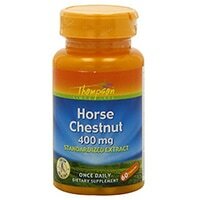 Horse chestnut dosage is generally recommended in the 400-600mg range per day, usually split up into two equal doses. 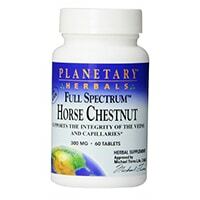 Split doses are recommended for best results, as the active components in horse chestnut take a long time to fully absorb. The supplement comes in capsule form and can be taken with or without food. 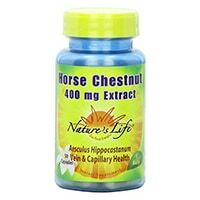 The higher quality horse chestnut supplements will clearly list the standardized amount of aescin within each capsule. Usually you’ll find supplements standardized to around 20% aescin. Dosages for actual aescin content should be around 100-150mg. 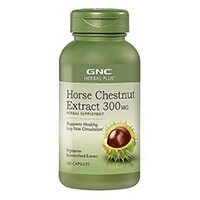 So, if a supplement offers 500mg of horse chestnut at 20% aescin, that would translate to a aescin dosage of 100mg. Horse chestnut supplements are generally considered safe for regular use as directed. Some side effects can include dizziness, headache, stomach upset, and itching. In rare cases, allergic reactions are possible. If serious side effects are observed, discontinue use immediately and seek the counsel of a medical professional. Keep in mind that raw, unprocessed horse chestnut can be toxic and potentially quite dangerous. The raw plant contains a toxic compound called esculin, which must be removed during the extraction process. This is why it’s very important to buy top horse chestnut supplements from reputable companies. Those with certain medical conditions should seek the advice of their doctor before taking horse chestnut. Pregnant women and those with diabetes, bleeding disorders, diabetes, digestive problems, liver disease and kidney disease should exercise caution when taking the supplement. Keep in mind that this is a supplement that has not been adequately studied for long-term use. While its use appears safe, there is insufficient research looking at long-term effects. Speak to your doctor if you have concerns. The best quality horse chestnut pills will be standardized to 15-20% aescin, the active compound in horse chestnut. A good product should contain an adequate dosage between 250 and 500mg of horse extract per day. Be sure to consider the aescin content when comparing dosages for different products.